Summary Kit of Homeplug AV2 1200 MIMO powerline adapter and powerline-connected AC1200 access point for Wi-Fi extension. Powerline technology has always been a tough sell in the U.S. After all, once you've experienced the freedom of wireless, who wants to be tied down to a physical location to connect to the internet? It also didn't help that the industry spent way too long fighting itself with competing standards, which confused buyers and held back technology development, trapping it at a woefully slow 14 Mbps for way too long. The HomePlug Alliance—apparently now rebranded just "HomePlug—was also never an effective advocate for the technology, at least never as effective as the Wi-Fi Alliance. So it's no surprise that the combination of powerline and Wi-Fi hasn't attracted the attention I've always felt it deserved. I've seen people turn themselves inside out over the years trying router after router, flashing alternate router firmware, illegally boosting transmit power, etc. to try to cover dead spots, never thinking to give HomePlug a shot to help get Wi-Fi where it was needed. 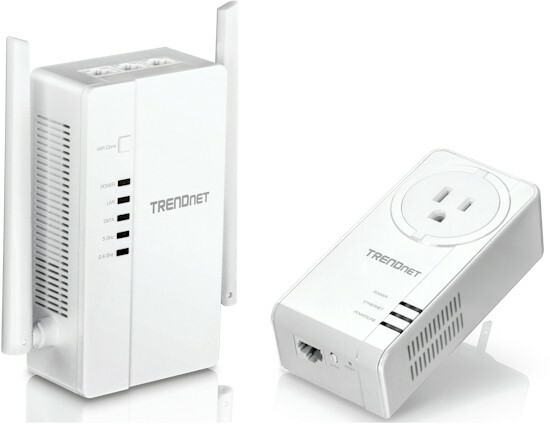 But TRENDnet apparently thinks the powerline/Wi-Fi combo is worthy of attention, producing the TPL-430APK WiFi Everywhere Powerline 1200 AV2 Wireless Kit I'm reviewing today. The kit combines a TPL-421E Homeplug AV2 1200 powerline adapter and powerline-connected TPL-430AP AC1200 class access point into a solution designed to bring "WiFi Everywhere"
Both pieces of the kit, shown above, won't win prizes for most compact designs, the access point in particular. Although TRENDnet thoughtfully designed the TPL-430AP so it doesn't block the top outlet of a U.S. duplex, the bottom of the AP extends a good three inches below the bottom edge of the outlet cover. And, as large as it is, the TPL-421E won't block the top outlet of a duplex, either. By the way, the TPL-421E is the same one reviewed back in 2015 and ranked #1 for powerline adapter performance. The placement of the three gigabit Ethernet ports on the AP's top is an interesting choice. While it makes it easier to plug and unplug cables, said cables will droop over it. The unsightly cable management combined with its definitely-noticeable size are sure to get noticed—not in a good way—by whoever calls the shots on home decor. You can hit the TPL-421E2K review for a look at its innards. The short story is it's based on Qualcomm's QCA7500 HomePlug AV2 MIMO device. Because the AP's FCC ID internal photos were too fuzzy for component identification, I opened it up the TPL-430AP after testing was complete. The design appears to be based on Qualcomm's REH152 reference design announced back in 2015. The top of the board contains most of the components. The bottom side of the board has the QCA8337 gigabit switch and one of the two RAM chips. One is presumably for the QCA7500 powerline operation, the other for the Wi-Fi side. Key components are listed in the table. The kit doesn't have a setup wizard and doesn't really need one, since you're not wirelessly connecting the AP to your router. The diagram below from the quick installation guide tells the tale. The AP and powerline adapter come set to the default "HomePlug" passkey, so they link right up. If you want to change the encryption key, you use the Sync button on adapter and AP. TRENDnet calls this setting up an "Encrypted Connection", but that's a common misnomer. Homeplug connections are AES-128 encrypted by default. Pushing the sync/encryption button just changes the default key so that other adapters can't join your network. You can also connect the AP via Ethernet and it will automatically lease an IP address from your LAN DHCP server. If that fails or you're just connecting a standalone computer to the AP to set it up, you can access the AP's at its default address, http://192.168.10.1, assuming you set your computer to an IP address in the same 192.168.10.X subnet. You can also hit http://tpl-430ap and you'll get the login prompt. You'll see the screen below when you log in, using the unique password found on the label enclosed in the product box. If brings settings you'll also find on separate pages into one. The page below shows all the wireless settings. Note the Max Clients setting, something seldom found in consumer Wi-Fi products. There are no band-steering or beamforming controls and no ability to disable radios. Since the AP doesn't support MU-MIMO, there are no controls for that, either. You can explore the TPL-430AP's online emulator (no password is required) and also download the manual to check out its features more closely.